Savour your time on a western guest ranch (also referred to as a ‘Dude’ ranch) while you take leisurely day trips to enjoy a rodeo, the Icefields Parkway, Lake Louise and Banff, and to visit Calgary. Enjoy the scenery while taking horseback trail rides and white water rafting, as well as multiple other activities included along the way. From Calgary your day one itinerary takes you across Alberta’s rolling countryside to a rustic guest ranch (some of you may know them as “dude ranches”), where you will spend the next six nights. A variety of wildlife are frequently seen here, and you will enjoy the very best of western hospitality in this restful western hideaway. After a hearty lunch you'll have the opportunity to take a trail ride in the area. Once back from your trail ride you can relax on the deck or take a hike in this wilderness wonderland. Then it’s time to enjoy the very best of western hospitality, including a generous dinner, before spending a restful night in this western hideaway. Day two starts with a satisfying breakfast and a trail ride. If you have selected the rodeo option as a part of your travel package (must include a Friday, Saturday or Sunday), then it’s off to a Traditional Rodeo, or perhaps a Native American Powwow and Rodeo. At the conclusion of the rodeo you head back to your guest ranch home for dinner, and another restful night. After day six’s morning trail ride or leisurely meander around the countryside, and another of those wonderful lunches, you’re off to the town of Banff. 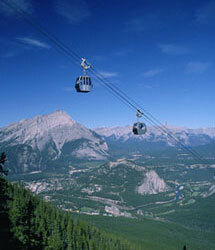 You’ll take an eight minute ride in a glass enclosed Banff Gondola to the 2288 m (7500 ft) summit of Sulphur Mountain, visit the majestic Banff Springs Hotel, stop at the Upper Hot Springs and enjoy the Banff town site, where you can tour the many fine museums and natural history centres, in addition to sampling the extensive and unique shopping opportunities. Once back at the guest ranch you’ll savoured another delectable western dinner. But don’t stay up too late, coming up tomorrow is your chance to enjoy Calgary and its many and varied pleasures. You spend day four in Calgary. Your first stop is The Canadian Wilds Exhibit at the Calgary Zoo. You will wander through this immersion habitat featuring animals from the Aspen Woodlands to the Rocky Mountains. It is a perfect location to start your wildlife viewing - you are guaranteed to see animals here that you may not have a chance to see anywhere else during your trip. Get a close-up view of mountain goats, cougars and grizzlies, wolves and wood bison, as well as one of North America’s most endangered species – the whooping crane. Today’s lunchtime dining experience features the Calgary Tower's famous revolving dining lounge. Then you visit the frontier town of Heritage Park Historical Village where the people are as real as their town. And your last stop for the day is dinner at Ranchman’s Restaurant which is often referred to as Canada’s Greatest Honky Tonk and Country Night Club. Then it’s back to your foothills home. After another wonderful breakfast, day five offers you the opportunity to enjoy your morning trail ride. The afternoon provides you with a choice of activities. You can take a guided hike on the Sunshine Meadows. OR you may want to go whitewater rafting in the Kananaskis Valley. OR you have the opportunity to enjoy another trail ride, relax on the deck, or take a leisurely hike around the familiar environment of your foothills’ home. And we haven’t forgotten that terrific dinner which it’s topped off with home-baked bread and pastry. On day three you will experience the incomparable beauty of the rugged and majestic Rocky Mountains. 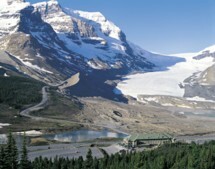 Your first stop is the Columbia Icefields, an area of glacial ice covering some 390 sq. km with a maximum depth of 365 m (1210 ft). Here you can visit the Columbia Icefield Visitor Centre and enjoy a ride onto the Athabasca Glacier via the Ice Explorer. From the Icefields, it’s a short trip to your first view of the imposing Victoria Glacier nestled behind beautiful Lake Louise. Then it’s back to your guest ranch home and a leisurely dinner and a good night’s rest. On day seven you can go on a morning trail ride, savour the majestic scenery on the beautiful hiking trails as you watch for birds and wildlife, or just sit back and soak it all in. Following lunch the next leg of your journey is a drive through Kananaskis Valley, and at the end of your day you arrive back in Calgary. * To include a rodeo in your travel plans, tour dates must include a Friday, Saturday or Sunday.